I was 12 when I went to my first starting line celebration. It was for the Yukon Quest, The 1,000 Mile International Sled Dog Race. The race started in Fairbanks that year, my hometown, so I decided to go with some friends. I remember how they looked, those working sled dogs, the most anxious animals I’d ever seen. Each sled had at least two sled brakes in the ground, to keep the dogs from taking off with the sled. Sled dogs don’t need a driver to know what to do when they’re strapped into their harnesses and roped in next to each other; it’s bred into their blood and in every instinct they’ve ever felt – pull. Figure 1. Effie Kokrine and her dog team. Effie was born when dog sledding was the dominant form of transportation and her father, Johnny Folger, ran a leg of diphtheria serum. Dog sledding is one of a few forms of mushing, which is a general term for any travel method powered by dogs. Dog sledding is unique from other forms of mushing, though, because Alaska Natives used it approximately 15,000 years ago, according to research done by the Yukon Quest. Sled dogs were used for many reasons, such as, transportation of people and their belongings, hunting, and protection. Survival in the arctic would have been nearly impossible without them. Traditionally, the average team consisted of approximately 3 dogs, each with their own separate lead, spread out like a fan (Fan Hitching). This way, if one dog fell through the ice or into a crevasse the rest of the team was safe, along with the sled and driver. The dog could be pulled up by his harness and lead, then treated for any injuries. Before breeding was popularized, a dog’s worth was based on work ability rather than looks. The most popular dogs in the north were the Inuit and Interior Village dogs. They were lightweight, but could carry loads almost three times their weight for long distances. These dogs have a number of qualities that make them perfect for pulling heavy loads long distances. The first unique quality they possess is a stiff spine, which gives the dog the ability to evenly distribute weight through out the whole of his back (where the harness is placed) without causing physical damage. 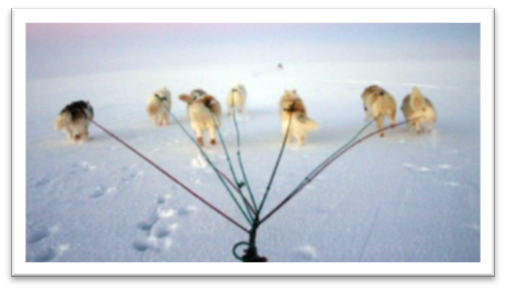 The dogs also have strong hips to push themselves forward, while their equally strong shoulders pull the harness and the sled load. 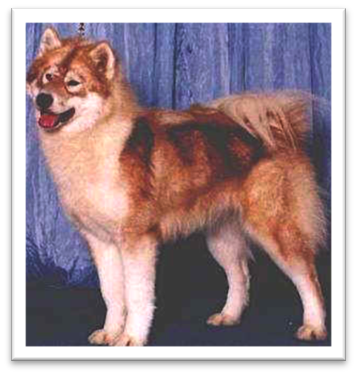 The second quality unique to sled dog breeds, such as malamutes and huskies, is the ability to change metabolism. This allows them to run for hours and hours while retaining fat storage and without becoming fatigued. In 1741, Russian explorers came with their sled dogs. 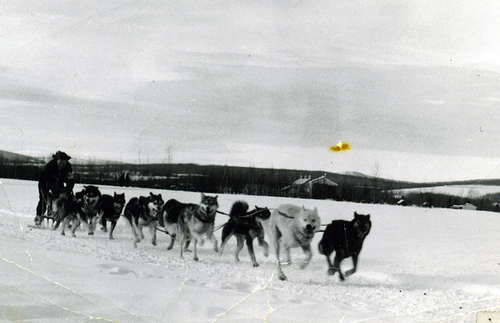 Their dogs were much smaller than the Inuit sled dogs because they were built for speed. These dogs were bred with the larger Village dogs to create a small and sturdy breed, with the same ability to pull heavy loads for long distances at an efficient pace. The Russians brought new dog sledding concepts with them (Gangline Hitching). 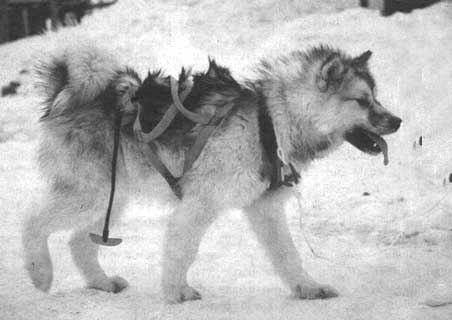 They developed the idea of a lead dog (the dog that drives the team forward and knows the trail and commands) increased the number of dogs in a team, changed sledding formations, added handles to the sleds, and added baskets to the sleds that were large enough and the proper shape to carry people. The demand for dogs skyrocketed, especially during the Gold Rush. Sled manufacturing was commonplace. Everything changed in 1913, when the first plane flew over Alaska. Airplanes could do all the same jobs as a dog team –delivering mail, bringing supplies to villages and towns, and carrying people from place to place—more reliably and more quickly. 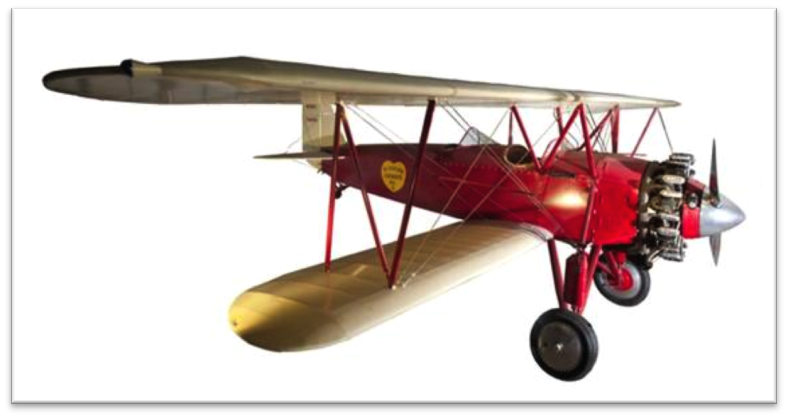 Stearman C2B biplane; Flown by several Alaska bush pilots, including Joe Crosson—first pilot to land on Mt. McKinley—and Noel Wein—founder of Alaska’s first airline. Mushing isn’t a necessity of life anymore. The most common place to see dog sledding is in annual races, such as the Yukon Quest and the Iditarod, but if you’re lucky enough to come visit Alaska, you could experience it the way the first Alaskans did—by dog sled—thanks to local tour companies.